APECA volunteers are the life blood of every aspect of our program, from the initial understanding of specific needs, to the hours spent in grant writing; from the management of administrative responsibilities, to educating midwives; from maintaining a website, to teaching composting to youth in a remote village; from translating a Peruvian government document, to creating culturally specific reforestation educational materials. If you can hold a pencil, shovel, book, bag of cement, hammer or pitcher of water for those who can, there is a place for you in the activities of APECA. Both APECA, Inc., of the USA, and APECA in Peru welcome your participation according to the calendars you will find on this site. 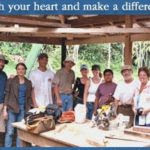 Especially sought at this time are those interested in reforestation/planting trees and gardens, using construction skills to build a new kitchen and dining area at EL Fundo, and medical practitioners of all levels to accompany general health campaigns and to teach first aid and sanitation in the villages. We invite you to join in shoulder-to-shoulder with ideas, skills, and your presence. To donate to APECA please click on the icon below, or you can mail a check to APECA, Inc. 23371 Mulholland Drive Suite #193, Woodland Hills CA 91364. Contact apecaperu@apecaperu.org with ‘VOLUNTEER’ in the subject line.